Use these tips to get your food-smattered oven clean and cooking again. Avid home cooks put their ovens into overdrive not simply during the holidays but year-round. What doesn’t land on the dinner table often winds up in the oven chamber—on the oven walls, roof, floor, racks, or window glass—as food splatter or debris. If neglected, these remains dry and harden to a point beyond what can be wiped away with a soapy rag. Then, deep cleaning an oven becomes a necessary chore at least every three to six months to keep the food from burning, which could negatively impact the flavor of your food or, worse, catch fire during a future use. But before you take a rag and the nearest cleanser on hand to your dingy oven, study up on the right and wrong approaches to getting your oven spotless. DON’T assume that all oven components can be cleaned. Read your oven manual to determine which components are safe for cleaning and which to avoid in order to prevent an oven malfunction. Generally, steer clear of the heating elements on the roof and floor of the oven; cleaning there could scratch the element or, if it’s still warm, cause it to produce a spark or flame. Similarly, take care of cleaning an oven’s flexible gasket (located on the interior of the oven door) to avoid degrading the oven seal that prevents heat from escaping from the oven. DON’T use chemical-based cleansers in self-cleaning ovens. If you’d rather buy than make an oven cleanser, read your oven manual to identify compatible commercial products. Chemical-based cleansers are safe for use in certain conventional ovens but not in self-cleaning ovens, where they might corrode the special enamel coating. Store-bought oven cleansers made of non-toxic, biodegradable ingredients (e.g., Carbona Biodegradable Oven Cleaner, which is available on Amazon) present a safer, more eco-friendly alternative to more toxic, chemical-laden cleansers. DO choose gentle DIY oven cleansers. Oven racks: Grab a box of baking soda (you need enough to sprinkle an eighth-inch layer over the racks) and a spray bottle filled with white vinegar; don’t combine them until you’re ready to clean. Oven walls, roof, floor, and oven window glass: Use a spoon to combine two cups baking soda, three-quarters cup water, and if desired for fragrance, eight to 16 drops of essential oil into a spreadable paste in a large bowl. DO start with a cool, empty oven. Before cleaning an oven, turn it off and completely cool it to avoid burning yourself while you scrub. Remove any pans, pots, and oven racks from the oven so that you can easily access the roof, floor, and walls of the unit while cleaning. Likewise, remove any loose food residue or large chunks of food debris from the oven chamber by gently scraping them off with a spatula. DO pre-soak individual oven components to cut cleaning time. Oven racks: Laying the racks side-by-side in an empty bathtub or a large kitchen sink, sprinkle each rack with a one-eighth-inch-thick layer of baking soda, then spritz with vinegar from a spray bottle. When the baking soda stops foaming, fill the tub or sink with enough hot water to submerge the racks, then let them dwell overnight. Oven walls, roof, floor: Use a gloved hand to spread your homemade oven cleaner over all visible interior oven surfaces, avoiding only the heating elements on the roof and floor. Let the baking soda paste sit in the oven for six to eight hours. Oven window glass: Spread any leftover homemade oven cleaner evenly over the window glass on the interior of the oven door. Allow 15 minutes of dwell time. DO tailor your cleaning techniques to each oven component. 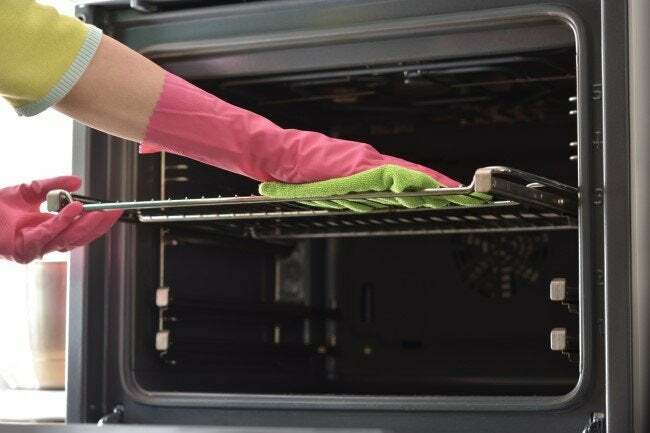 After pre-soaking each oven component, you’ll need to use different cleaning implements and wiping motions for each component to get them squeaky-clean. Start with the surface that required the least soaking time (i.e., the oven window glass), then move on to the oven chamber surfaces, and finish with the racks, which required the longest soak. Oven window glass: Using a damp microfiber cloth, wipe away loosened grime on the glass in a unidirectional motion to leave behind a streak-free shine. To remove residual baking soda paste, rinse the window glass with water and wipe dry. Oven walls, roof, floor: Using a damp sponge, wipe the oven sidewalls first, from the top down, then repeat this motion on the back wall so that ash chunks fall to the oven floor. Wipe the roof and then the floor of the chamber from back to front. 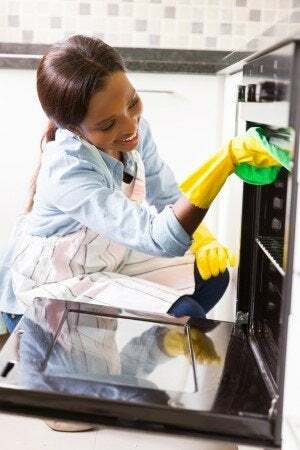 Rinse the sponge with clean water and repeat until no baking soda remains, then wipe dry. Oven racks: Drain the tub, and, moving perpendicular to the grates of each oven rack, scrub each rack with a rag to slough off the loosened debris. Rinse and dry the racks before returning them to the oven. DON’T use the self-clean feature when you’re on hosting duty. 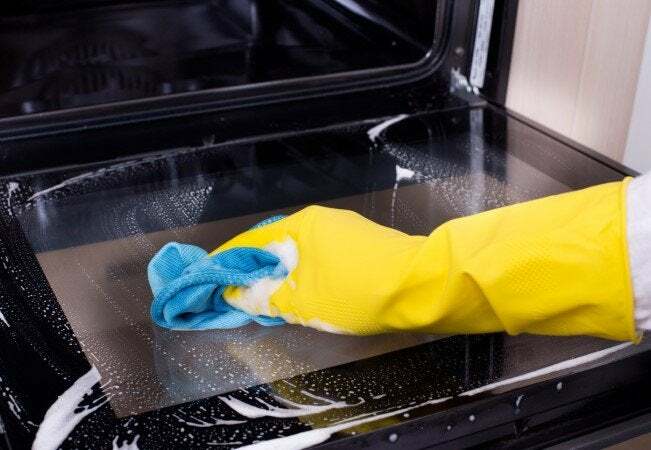 If your oven is equipped with a self-clean feature that blasts high heat or steam throughout the oven interior to release hardened food remains, consider running a self-clean cycle instead of manually scrubbing it when your oven is heavily soiled. Keep in mind that a self-clean cycle can put your oven out-of-commission for anywhere from half an hour to six hours depending on the model, release burning odors or fumes into the kitchen, or even short a thermal fuse or burn out a heating element if too much heat builds up. So you want to schedule self-clean cycles well before or after hosting big dinners and use it no more than five times a year. To use the feature, run a self-clean cycle according to the oven manual. When the cycle is complete, use a water-dampened rag to wipe loosened debris from the oven surfaces. DO use baking soda to stave off smoke from fresh oven spills. During a broil or bake session in the oven, if you notice liquid or food debris from a pot or pan in the oven spill onto the front area of the oven floor, immediately don an oven mitt, open the oven door, and sprinkle baking soda directly over the spill or debris to prevent it from smoking. If the spill isn’t in an accessible location of the oven, or if your oven is already smoking as a result of the spill burning, turn it off and let it cool completely. Then, open the oven door, remove any debris from the oven chamber with tongs, and wipe up the remains with a sponge dampened with soapy water. DON’T use aluminum foil to protect your oven floor. 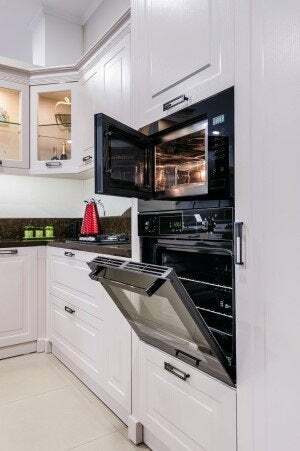 Many unsuspecting homeowners line the bottom of their ovens with a sheet of aluminum foil to help catch food spills and avoid sullying their oven floor. But the truth is that aluminum foil can reflect heat or block heat in both electric and gas ovens, leading to undercooked or overcooked food. Worse, it can melt onto the oven floor and permanently damage your oven. If you’re interested in saving yourself effort in cleaning an oven, you might lay a chemical-free oven mat made of fiberglass or other heat-resistant materials (e.g., Grill Magic Oven Liners, which are available on Amazon) on the oven floor instead. These options offer greater heat resistance than foil, making them a safer option for protecting your oven floor from spills as long as you position them so they’re not touching heating elements.